One of my favorite restaurants to open up this year is Perla, the West Village Italian restaurant in the old Bellavitae space on Minetta Lane. Perla comes to us from the team behind Fedora, Joseph Leonard, and Jeffrey's Grocery, and just like those spots, it is fun, festive, casual, and awesome. This is their Italian baby, and I absolutely love everything about this joint. Chef Michael Toscano's (Manzo) food is top notch, and I've enjoyed everything! Lobster ($19) with caviar, robiolina, and leek vinaigrette is superb and beautiful. Garganelli ($12) with tripe, guanicale, tomato, and chili is addictively fabulous. I wanted more and more of this dish, with each bite. I was in pasta heaven. Perfection. Raven and Boar whey fed pig ($14), is silky and delicious. Braised octopus with oven dried tomatoes, eggplant, and fettunta is mind-blowing. One of the best octopus dishes I've had. What took this too another level, besides the perfectly cooked octopus, was the sweetness of those fresh tomatoes. I loved this dish! 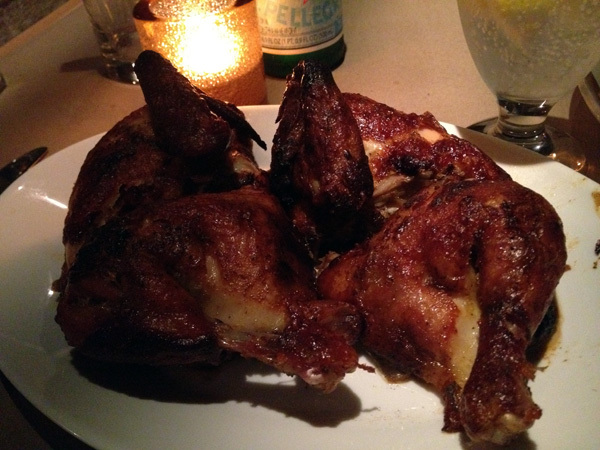 I don't eat too much guinea hen, but the guinea hen ($28) at Perla is great. Served with black trumpet mushrooms, brussels sprouts, and foie gras sugo, it's a more grown up gamier chicken, and a pleasure to consume. Tortelli ($12) with beet, ricotta, and parmigiano regianno is another splendid pasta dish. End with any of Perla's simple desserts, and you too will see why Perla is one of the best restaurants to open in 2012. A magical meal awaits.